Whenever you go on vacation, there are a lot of factors to consider when deciding on the right hotel to stay during your getaway. If your vacation destination of choice is Miami, one of the top factors to consider is the hotel pool; after all, lounging by the pool is bound to make up a significant chunk of your vacation in a warm weather city like Miami. To help you pick out a hotel that will appeal to you, here’s a look at some of the best hotel pools in Miami. When it comes to pools, the Setai hotel in Miami Beach offers guests three different options at three different temperatures. One pool is at 75 degrees for those who want to move around and go for a swim; another pool is at 85 degrees for those that just want to sit poolside and maybe dip their toes in the water; and the final pool is at 95 degrees for those who want to just jump right in and have a good time. Surrounding the three pools are plush, green lawns making it easy to walk from pool to pool, and not far from the three pools is a bar, making it easy and convenient to get something to eat or drink while lounging poolside. The pool at the Mondrian South Beach Hotel offers spectacular views of both Biscayne Bay and downtown Miami, especially at sunset, as the hotel faces to the west. The pool itself is pristine and surrounded by a maze lounge chairs, hammocks, and gardens so guests can rest comfortably in beautiful surroundings. For guests who desire a larger and more private space, there are outdoor living rooms and cabanas available, as well as cocktail and food options. You should also know that every Sunday at the Mondrian pool there are lounge style pool parties featuring some of the best DJs from South Beach, giving guests a chance to cut loose by the hotel’s lovely pool. The two pools at the Epic Hotel in Miami are just that: epic. The hotel features two rooftop pools on the 16th floor, where guests can enjoy incredible sunrises and sunsets. The view during the rest of the day isn’t bad either, as the hotel sits at the intersection of downtown Miami, the Miami River, and Biscayne Bay. There are plenty of chairs to sit in around the pools, as well as daybeds and private cabanas for those looking for a little more privacy and luxury. The hotel’s restaurant, Area 31, is nearby, so it’s not hard to grab something to eat or drink while you enjoy the two rooftop pools. Finally, there’s the Shore Club Hotel, which has two infinity edge pools that are in close proximity to the beach, making it easy for guests to move from one to the other and back again over the course of the day, giving them the best of both worlds. The lounge areas surrounding the two pools are second to none, featuring large beds, comfortable pillows, and lovely throws that are perfect for anyone who just wants to spend a day by the pool or beach. The pools at the Shore Club Hotel aren’t big, but they are beautiful, and they are among the most popular hotel pools on South Beach. When you travel for pleasure or business, do you dread having to check in when you get to the hotel? If you’re like many travelers, all you want to do is go straight to your room and settle in. Traveling can be very exhausting. Packing, making sure everything is in order before you leave and then dealing with the hassles associated with flying or making your way through traffic takes a lot out of you. After all that, you don’t want to stand in line to check into your hotel, too! Many hotels understand that having to spend time at the front desk after traveling to your destination is a burden for many people, which is why they began offering mobile check-in services. Anyone can use this service whether you’re traveling for business or taking a luxury vacation, provided you’re using a hotel that offers it. The purpose of mobile check-in is to enhance the overall experience of staying in a hotel by offering a simple and fast way to check into your room. Simply book your room with a hotel that offers this service. Then use your mobile device to access the app and check-in prior to your arrival. You’ll receive a notification telling you when your room is ready. When you arrive at the hotel, you’ll pick up your key card at the designated location and then you can go straight to your room without having to go by the front desk. It really is that easy! However, keep in mind that the actual process will vary depending on which hotel you use. Therefore, you’ll need to go over the details with the hotel representative when you make your reservation. The whole point of using this service is to make checking into your hotel easy. If you have any questions about how to use the app, be sure to ask when reserving your room. If you’ve ever had to wait in line to check into your hotel after a long drive or flight to your destination, you can understand why this service is quickly gaining in popularity. One of the main benefits you’ll get with this service is convenience. You won’t ever have to stand in line and wait to check into your room again. This means that you can be relaxing in your room while other guests are still waiting to get into theirs. Once you experience the benefits of using hotel mobile check-in for yourself, you may never want to use the front desk again. Luxury hotels like the Ritz Carlton in Miami thrive to make your stay a pleasant one. Offering mobile app services as part of their rewards program is just another way to make your stay more relaxing and enjoyable. You can even use the app to request special services the hotel offers. Being able to bypass the front desk when checking in or out of your room is convenient but not all hotels offer this service. Here at Luxury Rentals Miami Beach, we can help you find hotels in your desired location that offer mobile check-in along with all of the amenities you want and expect from a luxury hotel. With mobile check-in, you can begin enjoying your trip right away. You never have to wait in line or stand around a crowded lobby waiting to be checked in. It certainly makes staying in a hotel more convenient. How do you feel about this type of service? Have you used it before? If not, is it something that you would be interested in trying out? When planning your luxury vacation, finding the right hotel is at the top of the to-do-list. If you’re like a lot of vacationers, convenience is as important as having access to a variety of amenities. Having a hotel near the beach or in the area where you plan to spend the majority of your time is important. This will allow you more time to enjoy yourself instead of traveling from one destination to another. When a hotel offers all of the amenities you want and its located near the attractions, activities or events you want to participate in, then you could say that it has it all because it has everything you’re looking for in accommodations. Miami has a lot of very impressive luxury hotels that offer everything you could want when vacationing in this beautiful and exciting city. Hotels that seem to have it all are the ones you’ll find in prime locations with beautiful scenery and some of the most luxurious amenities you could imagine. These hotels will make your stay in Miami even more enjoyable. Four Seasons Hotel– This gorgeous hotel stands 70 stories high and offers all types of amenities that will make your vacation one you’ll always remember. Whether you’re relaxing on the enormous two-acre pool deck with the gorgeous skyline in the background or rejuvenating your body with a spa treatment, you’re sure to enjoy every minute of your stay. Mandarin Oriental Hotel– With a private beach club, holistic spa and amazing view from the rooms, this five-star hotel has a lot to offer luxury travelers. It’s conveniently located on Brickell Key Dr in Miami but it still offers all of the privacy you could want while on vacation. 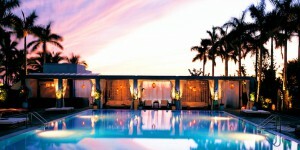 The St. Regis Bal Harbour Resort– Forbes recently awarded this hotel the AAA five-diamond and five-star awards. This gives you an idea of what to expect from this elegant hotel with its gorgeous oceanfront view. The amenities are amazing and the service is exquisite, making it an excellent choice for all travelers. JW Marriott Hotel– The Marriott stands out for its uniqueness. It features a stainless steel swimming pool and the hotel has received several awards for its elegant décor, unique design and excellent customer service. Whether you’re traveling for business or pleasure, you’re sure to enjoy your stay. Tides Hotel– Located in the central part of South Beach, the Tides Hotel puts you within walking distance of all forms of entertainment, shopping and fine dining. Every room in the hotel has a view of the ocean and the hospitality can’t be beat. These luxury hotels stand out because they are conveniently located in areas near the beach, shopping, restaurants and other attractions and events that many vacationers look for when choosing accommodations. They also offer all of the amenities you need to have a fun but relaxing vacation. When you visit a luxury hotel, you expect more of everything. You expect the staff to be extra friendly and helpful and you expect your room to be comfortable with a gorgeous view. That is what separates these hotels from all the rest. They have everything you could want or need to make your vacation a fun and enjoyable experience. They offer some of the best amenities found in Miami and that combined with their prime locations make them an excellent choice for all types of visitors. It’s what makes them special. Contact us here at Luxury Rentals Miami Beach to learn more about these and other hotels available in this amazing city. We’re here to help you find the best accommodations for all of your traveling needs. When you decide to take a luxury vacation, booking a room at your favorite hotel is one of the first things you need to do. You can call or use the Internet to make your reservations but before you book your stay, make sure you’re getting the right room for your vacation. If you just automatically ask for the same type of room each time you make reservations, you could be missing out on a great experience. There are several different types of luxury hotel rooms to choose from for a reason. Luxury hotels want to make sure you have more than just a vacation. They want you to thoroughly enjoy your stay, so you’ll continue to return each year. They also know that your room plays an important role in how much you enjoy yourself, which is why they offer a variety of room options. Different hotels will have different types of rooms available, so you’ll have to check with each one to find out what they offer. However, when they’re going through the list or when you’re searching for the perfect luxury hotel in Miami Beach, you need to understand what they’re offering so you can make a good decision. How do you choose the best luxury hotel room for your vacation? Learn a little about each one of your options so you can pick the one that suits your needs the best. You can also try a different type of room each time you take a vacation to see firsthand which ones you like best. Standard– These are the most basic rooms available and they usually come with a single or double bed depending on if you’re traveling alone or with a partner. Twin– These normally have two separate single or double beds to accommodate two to four people. Deluxe– These are a step above the single and twin rooms offering a better view and location. They usually offer more square footage, too but they’re not as luxurious as some of your other options. Junior Suites– These are normally one large room with a divider separating the living area and the bedroom. Suites– If you’re planning an extended stay or value your privacy, suites are a good option because they have multiple rooms and look more like a small apartment. Executive Suites– These normally offer special amenities such as a lounge where you can relax and have a few drinks without straying far from your room. The Honeymoon Suite– These are gorgeous rooms and you can expect to be pampered throughout your entire stay. Rooms with a View– Several different rooms fall into this category and basically, it means that the room is overlooking a view. Since these rooms can mean a variety of different things, you’ll need to talk to the hotel representative to make sure you’re actually getting what you think you are. This is very important because an ocean view room could mean that you can stand on your balcony and see the beachgoers or it could mean that you’re near the top of the hotel and can see the ocean from a distance. The best way to make sure you’re getting the best room for your vacation is to ask a lot of questions. That is what the representatives are there for. Here at Luxury Rentals Miami Beach, we have a good selection of hotels to choose from that offer a wide variety of rooms. All you have to do is tell us where you want to stay and what type of room you’re looking for. We’ll use this information to find the best room for your specific needs. If you have special needs such as traveling with someone handicapped, you can also find luxury rooms that are handicap accessible. Deciding which type of room to book can be a little confusing but once you understand what you’ll get with each type, you can make a better decision. It’s also important to remember that you’re staying in a luxury hotel, so even the simplest rooms will still come with extra amenities to make your stay a pleasant one. However, rooms with more space, privacy or special amenities can make your luxury vacation even more enjoyable.